Mouse PLGF (PGF-M52H0) is expressed from human 293 cells (HEK293). It contains AA Val 19 - Pro 158 (Accession # P49764-1). The protein has a calculated MW of 17.8 kDa. 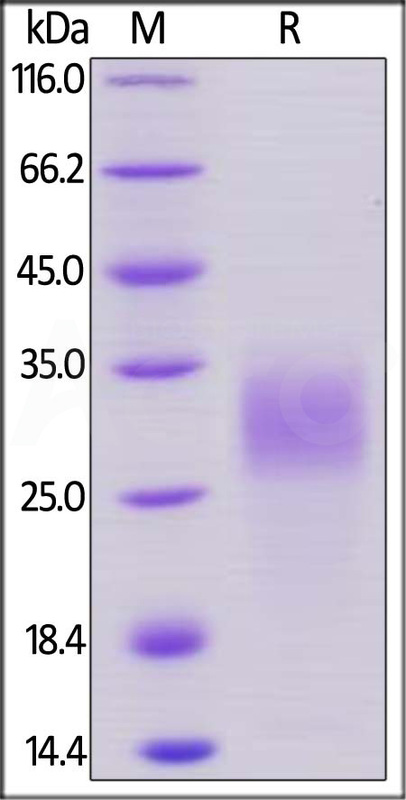 The protein migrates as 27-35 KDa under reducing (R) condition (SDS-PAGE) due to glycosylation. Lyophilized from 0.22 μm filtered solution in 100 mM HAC, pH2.5. Normally trehalose is added as protectant before lyophilization. Mouse PLGF on SDS-PAGE under reducing (R) condition. The gel was stained overnight with Coomassie Blue. The purity of the protein is greater than 95%. Immobilized Mouse VEGF R1, mouse IgG2a Fc Tag (Cat. No. 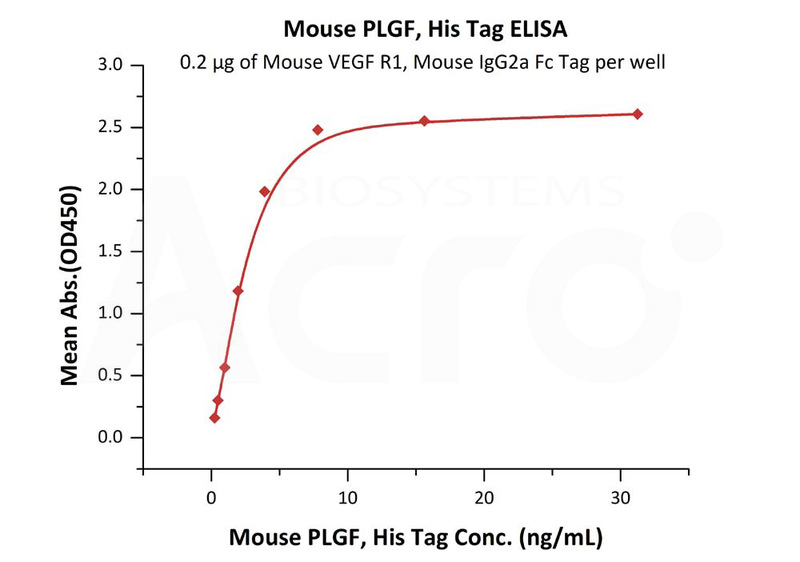 VE1-M5256) at 2 μg/mL (100 μL/well) can bind Mouse PLGF (Cat. No. PGF-M52H0) with a linear range of 0.2-4 ng/mL (QC tested). Placental growth factor (PGF) is also known as vascular endothelial growth factor-related protein, PLGF and PlGF2, is a member of the VEGF (vascular endothelial growth factor) sub-family - a key molecule in angiogenesis and vasculogenesis, in particular during embryogenesis. The main source of PGF during pregnancy is the placental trophoblast. PGF is also expressed in many other tissues, including the villous trophoblast. PGF is actived in angiogenesis and endothelial cell growth, stimulating their proliferation and migration. PlGF2 binds NRP1/neuropilin-1 and NRP2/neuropilin-2 in a heparin-dependent manner. Also promotes cell tumor growth. (1) Maglione D., et al., 1993, Oncogene 8 (4): 925–31. (2) Khalil A., et al., 2008, PLoS ONE 3 (7): e2766. (3) Khurana R., et al., 2005, Circulation 111 (21): 2828–2836. (4) Rolny C., et al., 2011, Cancer Cell 19:31-44.